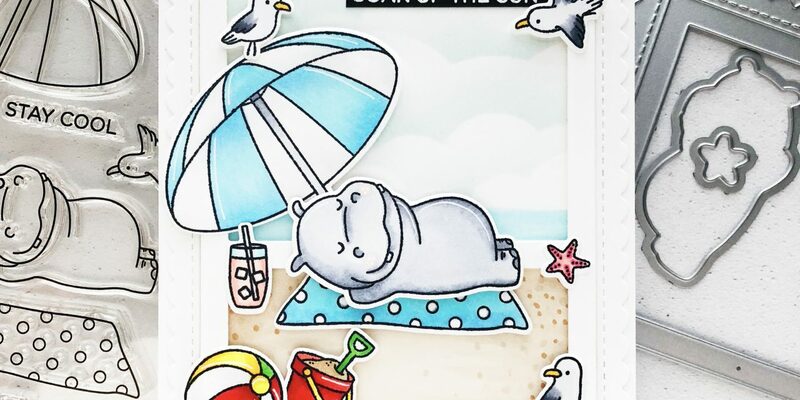 Caly here sharing a card I made using the Hippos on Holiday set from the May Release. 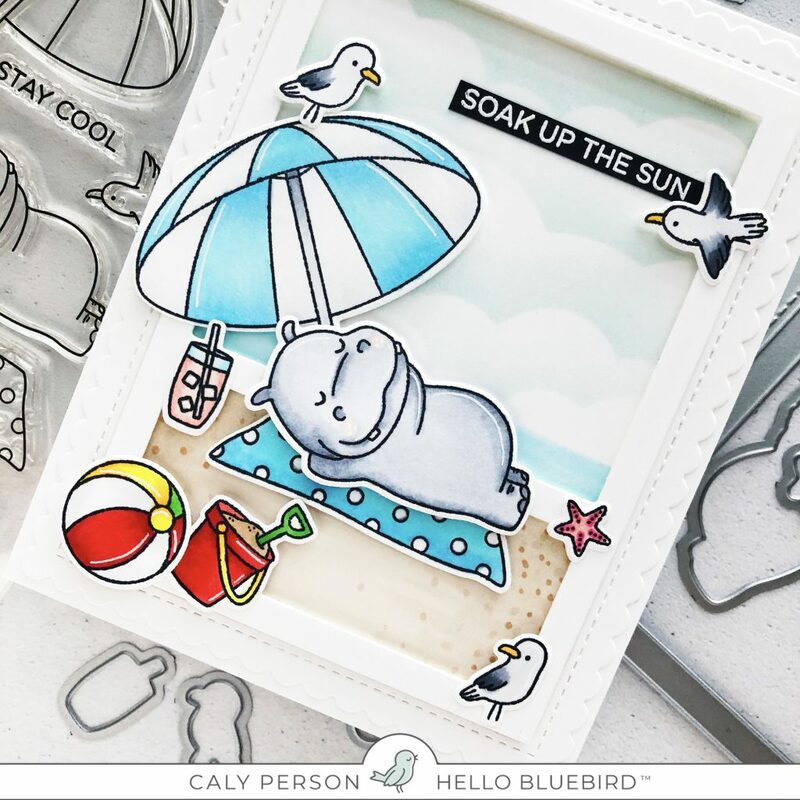 I thought I would share a summer card before the August Release – you’re in a for a treat! 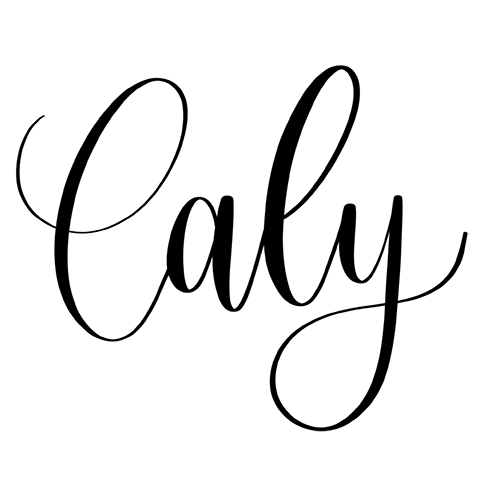 We can’t wait to share sneak peeks and projects with you very soon. 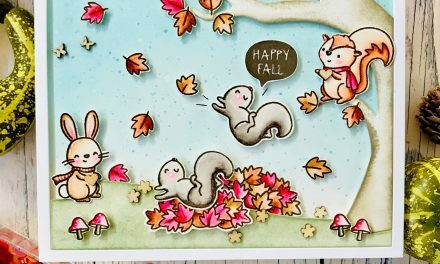 I stamped the images using a Copic-friendly ink and colored them using Copic markers. The Copic colors I used are: E41, E42, E34, C0, C4. C6, Y06, Y17, R000, RV42, RV25, R14, R29, B00, B21, YG07, G14. After coloring, I used the coordinating Hippos on Holidays Dies to cut out the images and set them aside to work on the scene. I die cut the Gallery Frame Die #2 using white cardstock. Using a pencil, I make light marks on the card base as a guide so I don’t run off the edges when coloring. 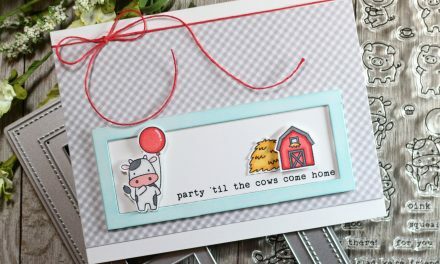 I used a cloud stencil and did some light ink blending using a light blue. Then using copics, I drew in the ocean waterline and colored the lower panel to create a beach/sandy scene. I propped the inner frame up using foam tape and adhered the various pieces in different places to give the card some added dimension. I hope you enjoyed this project. Thank you so much for stopping by the Hello Bluebird blog today! Love the card. Fiona the hippo at the Cincinnati Zoo going to use for her for someone that loves her. 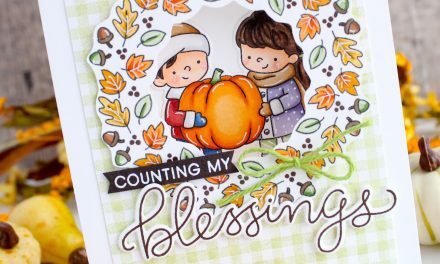 Awesome stamps and dies. Love your adorable card Caly. Great design and love your fun, bright color choices.